What is wrong with this "picture of Aurora from Space"? Answer: everything! Last night (27-28 Feb 2014) saw a geomagnetic storm that caused Northern Lights (Aurora borealis) in Europe at latitudes as low as 50 deg North. My home town was largely clouded out, but reports and images from elsewhere in the Netherlands as well as the UK, Ireland and Germany poured in. As part of the buzz surrounding this auroral display, the image above was widely shared on Twitter. It purports to show aurora as imaged by "NASA", with some retweets adding that it was purportedly taken from the International Space Station. Real images of aurora taken by NASA, ESA, Roscosmos and JAXA astronauts onboard the ISS do exist. But the image above is not one of them. It is completely fake, and it takes a knowledgeable person only a split second to recognize it as such. Still, and rather surprisingly, even some professional Space and Astronomy organizations that should have known better initially fell for it and retweeted it. One thing that immediately struck me was the lack of atmosphere. The image shows about 1/3rd of the Earth globe, but no clouds and no limb brightening. That immediately makes it clear that the earth globe shown is a digital rendering, where a cloud-free map of the earth has been digitally wrapped around the globe. It is not a true photograph of the earth from space. In addition to not showing an atmosphere, it does show something it should not show: bathymetry in the ocean.It shows the continental shelf as a lighter-coloured element in front of the Canadian coast. The continental shelf is often depicted as such on maps, but not actually visible as such on real satellite imagery. Again, this shows that a map of the earth including bathymetric elements was digitally wrapped around a globe: it is not a true photograph of the earth from space. Apart from these two clear flaws, the whole image in fact clearly looks digitally rendered. The contrast between the daylight and nighttime parts of the earth is much too low too. The auroral ring (actually an oval) is wrongly positioned on the globe. In the image, it is centered on the true Pole (the earth's rotational axis), in the Arctic sea. In reality, Aurora is however a phenomena connected to the Earth's magnetic field, and it therefore is centered on the Geomagnetic pole. 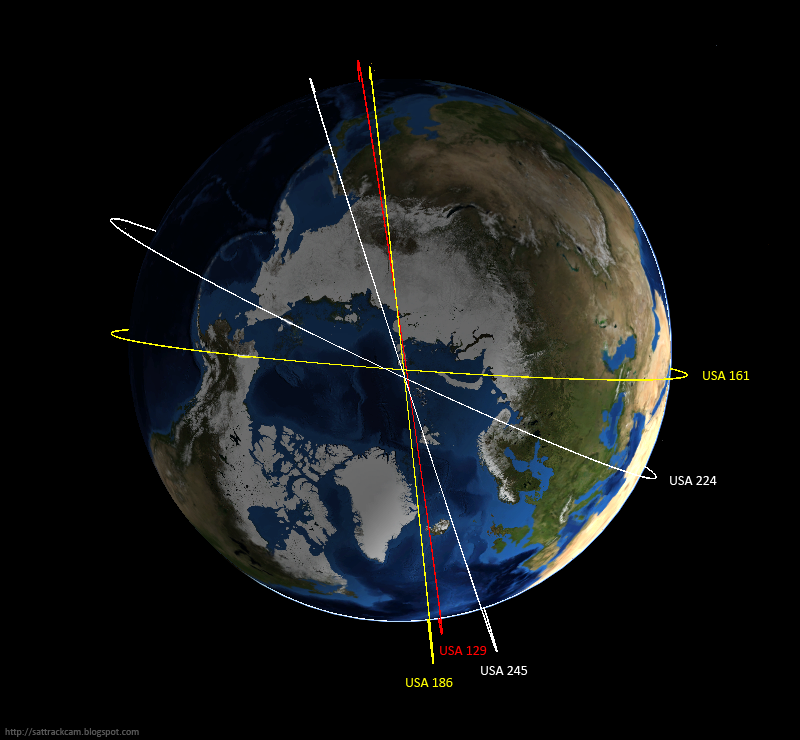 The Geomagnetic pole is distinctly off-set from the true pole: it is located in Northern Canada, on Ellesmere Island. The auroral ring/oval is a complete ring on the image. In reality, the real auroral oval is much better developed on the night-time side of the globe than on the daytime side. 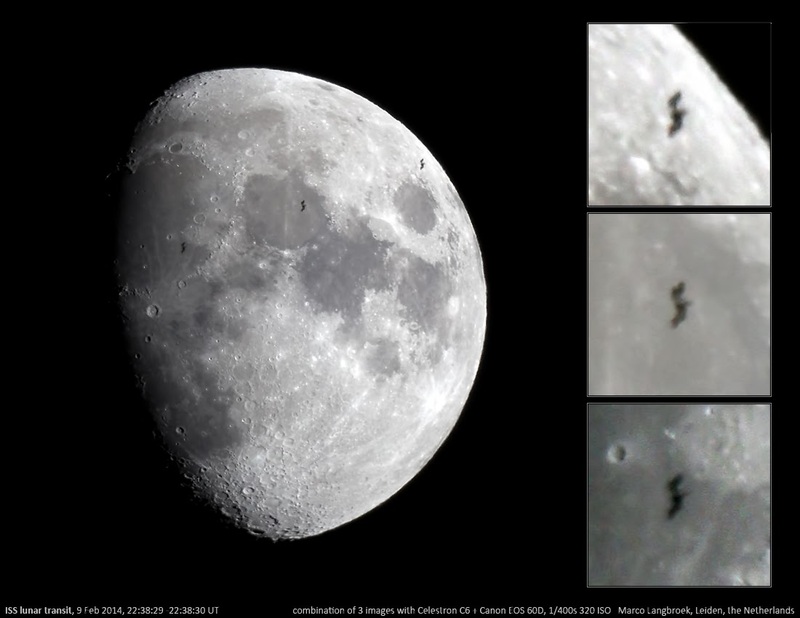 Some retweets added that the image purportedly was made from the International Space Station. 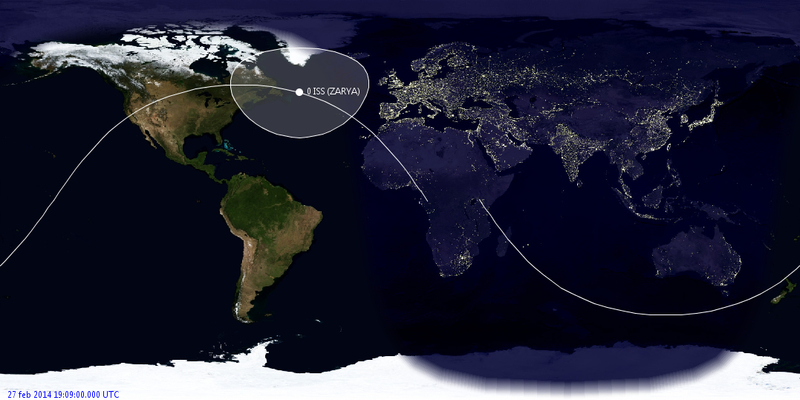 The ISS is however in a low 400 km altitude orbit. Aurora itself extends from 80 km to 200-300 km, during strong outburst up to 600 km altitude. In other words, the ISS orbits not much above, and in some cases even at similar altitudes as the aurora. 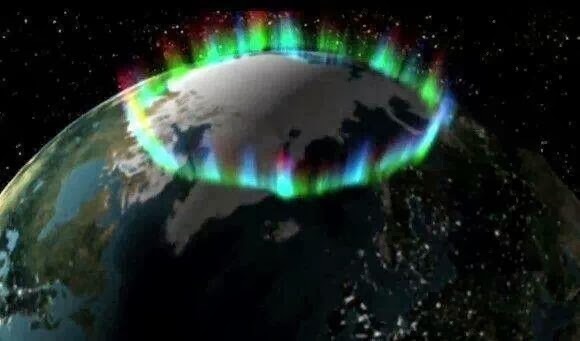 It does not orbit as high above earth and the aurora as shown in this picture. The white filled circle is the area of the earth visible from the ISS. Clearly, an astronaut onboard the ISS cannot view as much as 1/3rd of the globe or more in one time, as the picture shows. Some sources say this image in reality is a digital 3D rendered graphic from an unidentified "NASA video". I doubt that NASA is the source: there is too much wrong with the graphic itself. Notably exhibit #3 and exhibit #4 are so sloppy from a scientific viewpoint, that I doubt such errors would be allowed in a NASA video. This issue of fake images popping up when an event gathers attention in the twittersphere, is interesting: someone, somewhere picked up that image and tweeted it with a BS story attached to it. This happens very often. Even more interesting is how it highlights the quick dissemination of misinformation through social media, even by people that should know better. I was rather surprised to see several persons and organizations that should have recognized it is a fake retweeting this image. In yesterday's post I mentioned that while the southern hemisphere window on the evening Keyhole/Crystal satellites ended early February, for us in the northern hemisphere it is just starting. After Greg in South Africa did the last southern hemisphere observations of USA 186 (2005-042A) on Feb 12, Cees in the Netherlands did the first northern hemisphere observations on Feb 21. As current passes at 52 N are still restricted to visibility very low in the northern sky, I could not target the satellite from my regular town center location (which has obstruction by buildings in the north). I therefore did a short bicycle trip to a spot 2 km southeast from my home, in the Cronesteyn polder on the eastern outskirts of Leiden. Visibility is horizon to horizon there. As I expected the satellite to be faint this low in the N-NW sky, I used the 1.4/85 mm lens instead of the 2.5/50 mm lens I normally use on the KH-11 satellites. 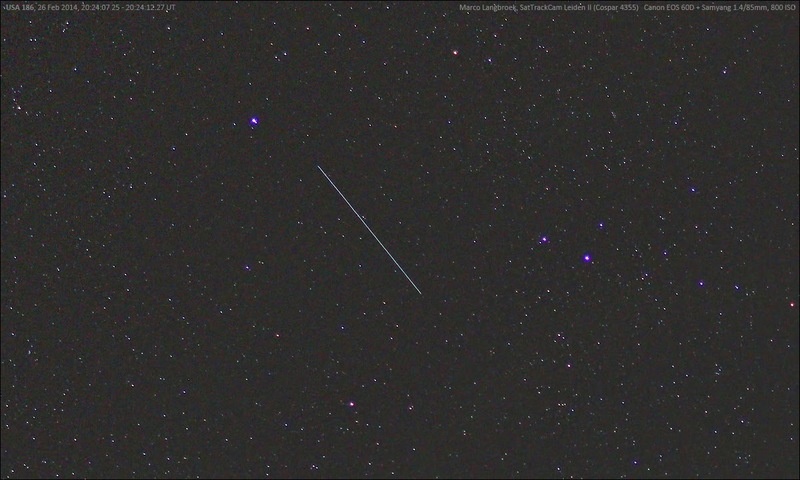 The satellite registered well on the images, and was some 10.3 seconds early on a 5-day-old elset. It is evidently still drifting in RAAN (see previous post). As visibility improves over the coming weeks, it will be interesting to follow it. I also targetted some parts of the geostationary belt, but have not come yet to measuring those images (probably this weekend). If weather cooperates the coming week, I will return to this observing spot to try to recover the new primary West plane KH USA 245 (2013-043A), which hasn't been seen since Greg's observations of January 11, i.e. for almost two months. USA 129 is not visible from 52 N yet. 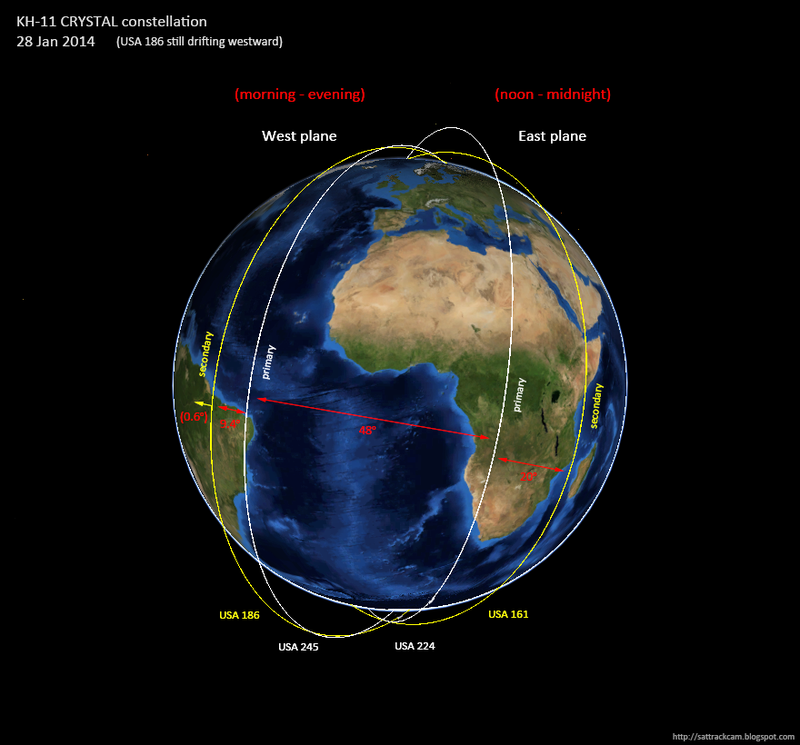 Over the past months I have posted a number of analysis and prognosis with regard to the likely changes to the KH-11 Keyhole/CRYSTAL constellation of optical reconnaisance satellites, following the launch of USA 245 (NROL-65, 2013-043A) into the KH primary West plane on August 28, 2013. The most important of these posts can be found here (Sep 16, 2013), here (Oct 12, 2013) here (Dec 22, 2013), and here (Feb 1, 2014). One of my predictions was that USA 186 (2005-042A) would be moved from the primary West plane to the secondary West plane, 10 degrees west in RAAN from the primary plane. Indeed, it initially seemed to keep to my prediction as mid-November 2013 USA 186 made a manoeuvre that involved a 1-degree inclination change. 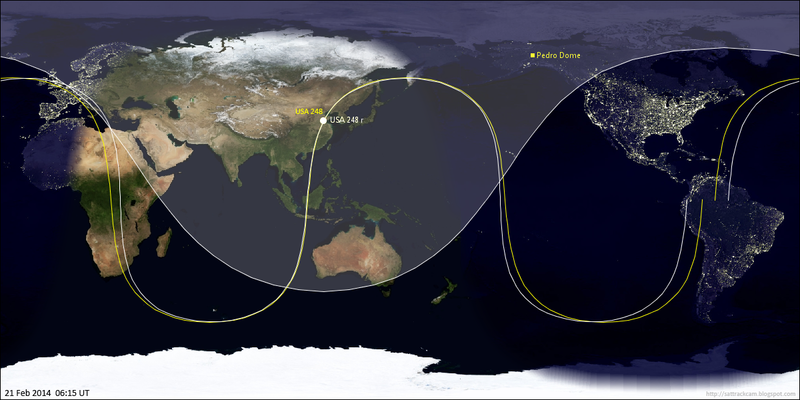 As a result it lost its sun-synchronous precession rate and started to drift westward relative to the other KH-11 satellites, moving orbital plane out of the primary West plane towards the secondary West plane. 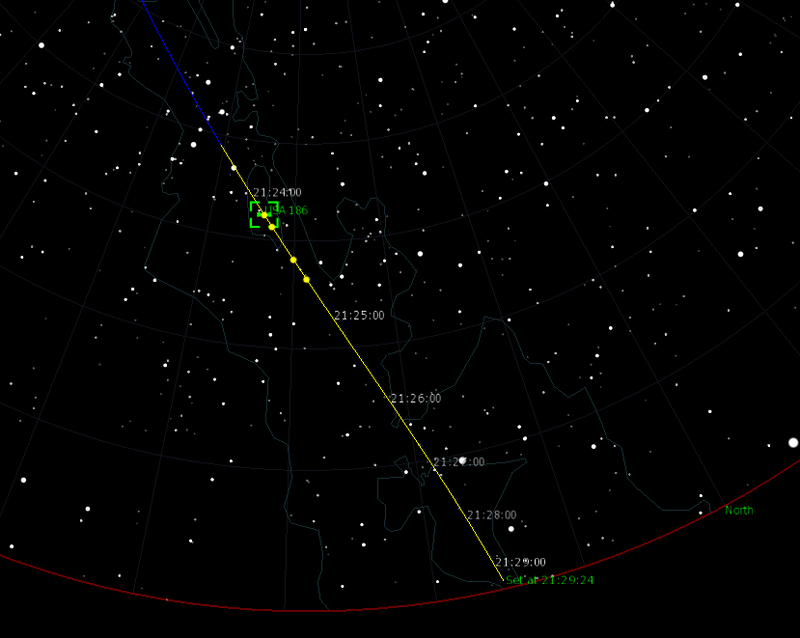 Its precession rate was such that it would reach a 10-degree difference in RAAN with the new primary plane satellite, USA 245 (2013-043A) near Feb 6. I therefore expected USA 186 to manoeuvre near that date, a manoeuvre that should entail an orbit circularization including a significant lowering of the apogee (after which the orbit would be sun-synchronous again and the westward drift would stop). So as Feb 6th neared, we held our breath. And nothing happened. USA 186 did not manoeuvre. It is still drifting westwards, at a rate of 0.12 degrees/day relative to the other KH-11 satellites. My prediction failed. Greg Roberts in South Africa did a good job in tracking USA 186 right up to February 12. As his southern hemisphere summer observing window was coming to an end, he could no longer follow it after that date. Luckily, it is coming in reach of northern hemisphere observers, and Cees Bassa in the Netherlands picked it up on February 21 with the first Northern hemisphere observations of 2014. Now USA 186 has not manoeuvered, it is time to entertain my alternative scenario which I presented near the end of this post on Dec 22 and this post on Feb 1. That alternative scenario is that the drift will continue until the difference in RAAN between USA 186 and USA 245 amounts to 20 degrees (instead of 10 degrees). 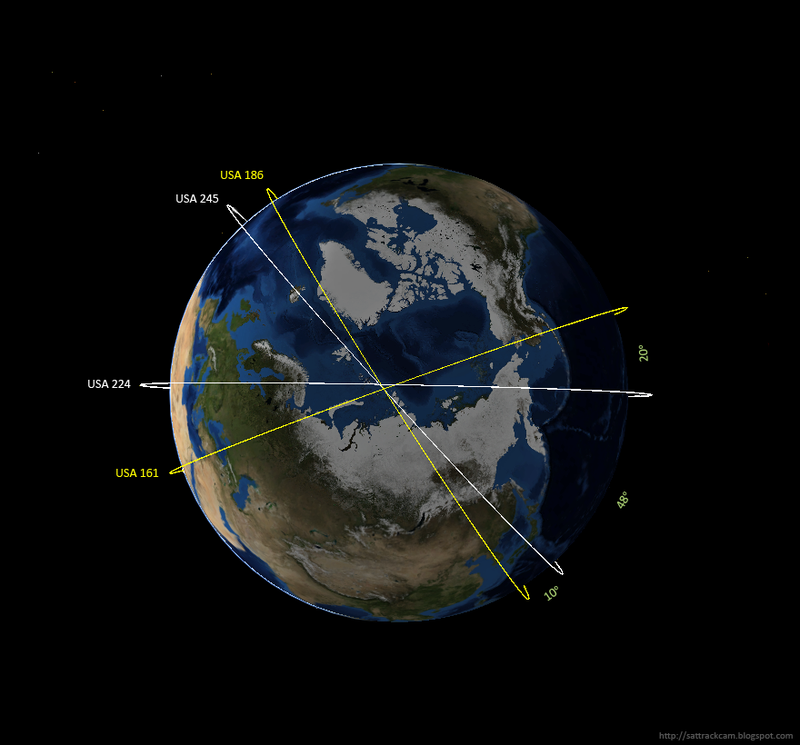 This is a RAAN difference similar to that between the primary and secondary East plane satellites, USA 224 and USA 161. It would create a 90-degree angle in RAAN between the outermost, secondary East and West plane satellites (USA 161 and USA 186). At the current drift rate, these values will be reached early May. It is clear that the current, drifting orbit of USA 186 is not an intended end state. 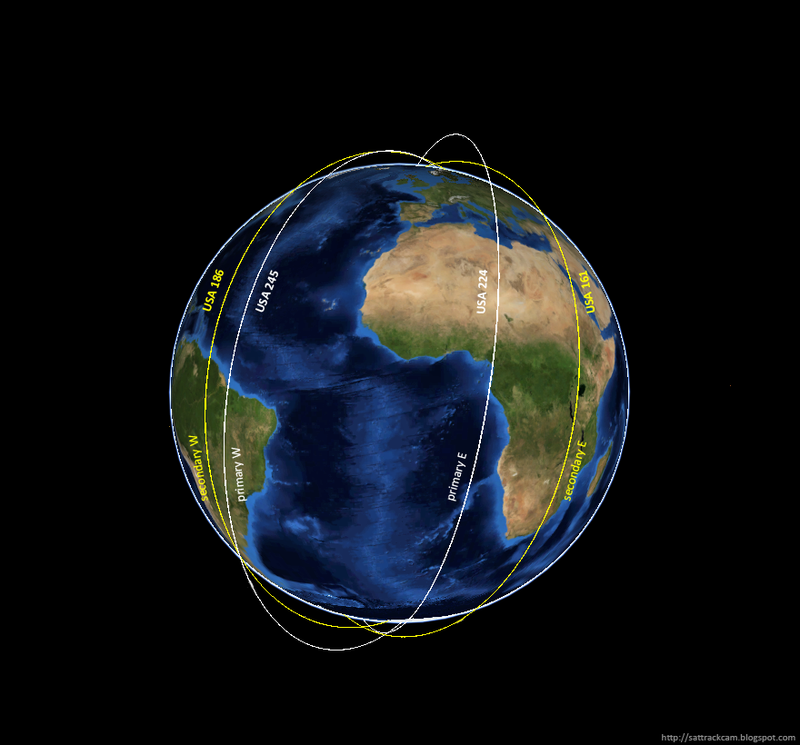 The orbit is not sun-synchronous, a must for an optical reconnaissance satellite. The inclination change it made mid-November 2013 is such that a manoeuvre into a ~380 x 400 km orbit similar to USA 161 in the secondary East plane will restore a sun-synchronous precession rate. So that appears to be the intended goal in the future. The current non sun-synchronous orbit is meant to let the RAAN drift up to a desired value. The question now is, what final RAAN value relative to the primary plane is intended. My guess, now it has turned out to be not 10 degrees, is 20 degrees. Meanwhile, another question is what they intend to do with the "old" secondary West plane satellite, USA 129 (see the post here). 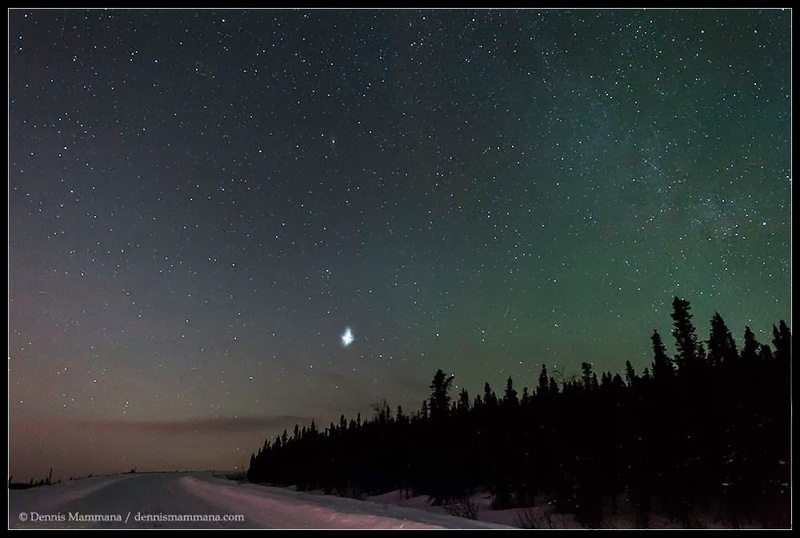 Yesterday an intriguing photo shot from Pedro Dome near Fairbanks, Alaska (USA) by Dennis Mammana appeared on the Spaceweather.com website. It showed a butterfly-like cloud in the starry sky, in the Pegasus square. The image can be seen here (scroll down a bit) and was taken near 6:15 UT on February 21, 2014, from a location near 65.04 N, 147.457 W.
The cloud looks very much like a satellite or rocket booster fuel vent. But what satellite/rocket was responsible? 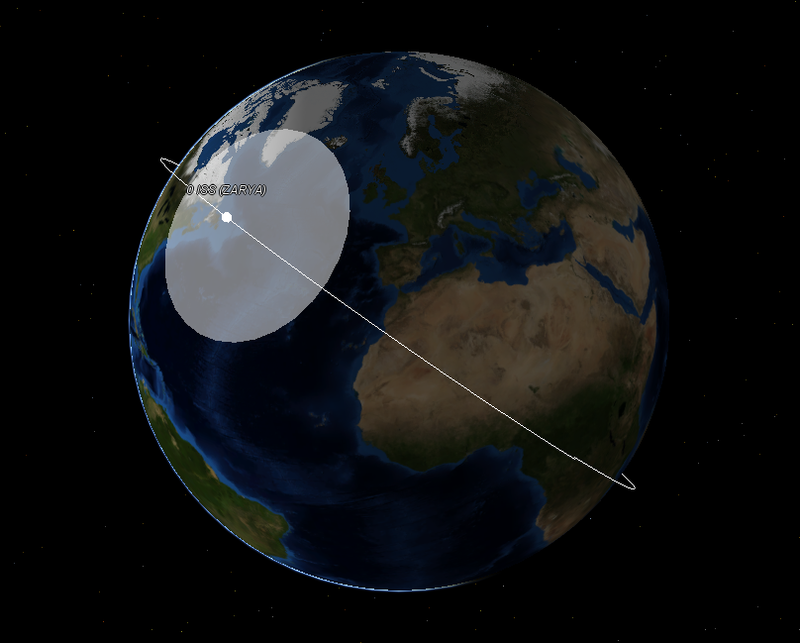 Early suspicion was that it could be connected to the launch of a new GPS Navstar satellite, USA 248/Navstar 2F-05 (2014-008A) from Cape Canaveral a few hours earlier. Upon seeing the image and checking a few things, I could quickly confirm that this indeed was a fuel vent related to this launch. The satellite was launched near 01:59 UT on Feb 21 (evening of Feb 20 local time in the USA) from Cape Canaveral in Florida using a Delta IV medium rocket. It separated from the second (final) rocket stage 3h 33m 05s after lift-off, i.e. around 5:32 UT (Feb 21) while coasting just east of Hainan, China. This was some 43 minutes before the observations from Alaska by Dennis Mammana. 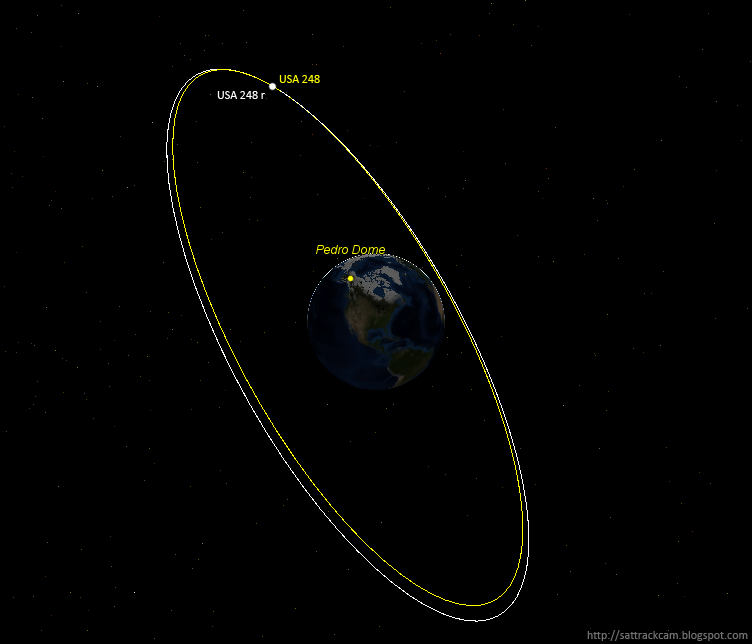 Upon separation the satellite was placed in a 54.98 degree inclined orbit at an average altitude of 20470 km. The rocket stage moves in a quite similar orbit. 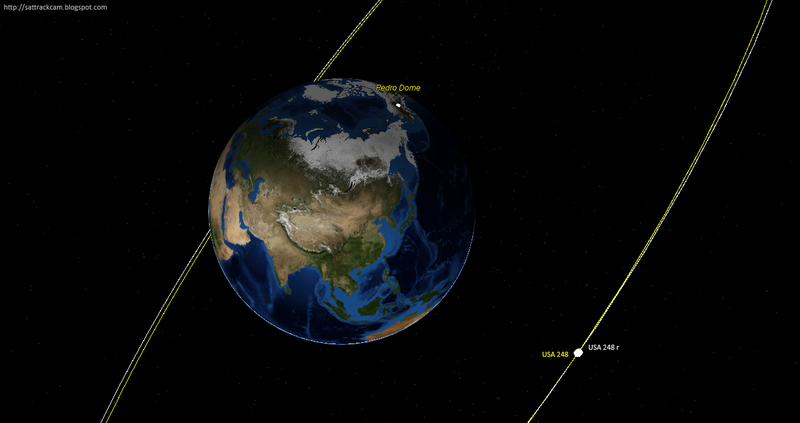 At the time of Mammana's observation, barely 45 minutes after separation, the satellite and rocket stage were still close together (they were only some 30 km separate in space) coasting over Beijing, China, at an altitude of 20 482 km and moving northwards. 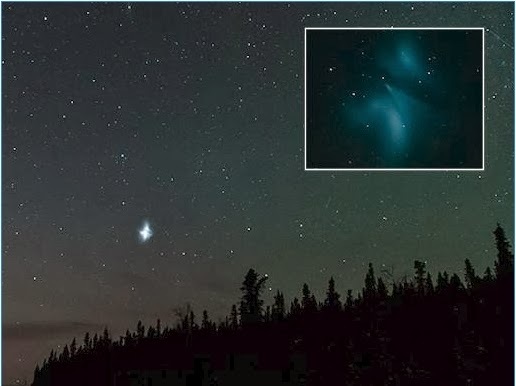 As seen from Pedro Dome in Alaska the two objects were within a few arcminutes of each other low in the Western sky, at a range of 24 300 km to the observer. The rocket stage and the GPS satellite's sky positions agree closely to the position of the butterfly cloud photographed by Mammana (compare the map below with Mammana's photograph). As seen from Pedro Dome, Alaska, the rocket stage was at an elevation of 17 degrees almost due West in the sky (az 290 degrees) at 6:15 UT (Feb 21), near RA 23h44m57s, dec. +23 47'. This is in the square of Pegasus, indicated with red lines in the map above. The satellite was near RA 23h44m26s, dec. +23 43'. This is based on Space-Track elements for epoch 14052.70 (Feb 21.70 UT) for the rocket stage and epoch 14052.27 (Feb 21.27 UT) for the satellite. For the object on Mammana's images I measure (with an accuracy no better than 1 arc-minute due to limited resolution of the published image) RA 23h 44m, dec +23 42' (2000.0) using AstroRecord and the image posted on Spaceweather.com. Mammana cloud * 23h 44m +23 42' meas. Satellite 23h 44m +23 43' pred. Rocket stage 23h 45m +23 47' pred. These positions are within arcminutes of each other. The position I measure for the approximate center of the butterfly cloud has a smallest miss-distance to the track of USA 248 of only 0.13 degree. These are values so close (particularly giving the measurement uncertainties and epoch differences) that the identification with a fuel vent from the GPS launch can be put forward with strong confidence. Update: a second image by an observer in Canada, David Cartier, has now appeared (with thanks to Tony Philips for pointing me to it). I thank Dennis Mammana for his permission to reproduce his photographs. As I wrote in a previous post last week, the KH-11 Keyhole/CRYSTAL optical reconnaisance satellite USA 129 (1996-072A) had not been seen since January 27. We therefore presumed it might have been de-orbitted, as it is very old (17+ years, the longest operational lifettime of any of the KH-11's) and USA 186 is to take over its former orbital plane in two days from now. We were wrong: USA 129 is still alive! 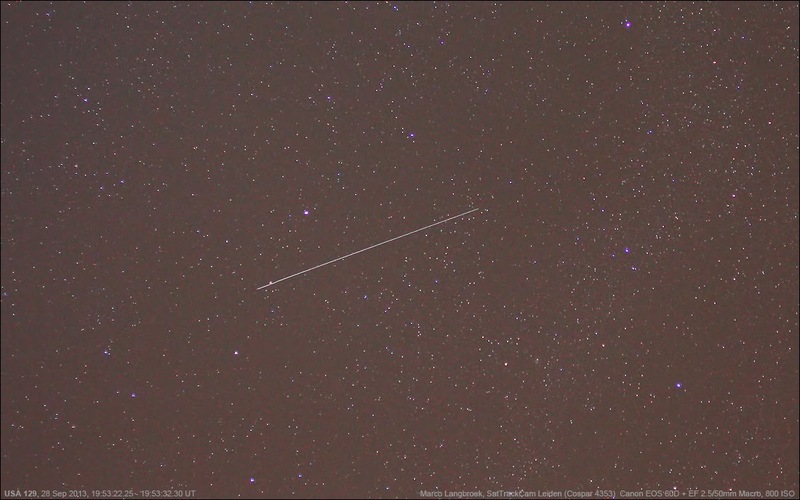 Greg Roberts observed it from S-Africa last night, after a dedicated 2.5 hour plane scan, and observed it over two passes. A quick fit to his observations by Ted Molczan suggests that the perigee of the satellite might have been brought significantly down, to 240 km (was 310 km). More observations are needed to say anything more about this. This is something new. I really did not expect USA 129 to manoeuvre into a new orbit. It should be noted that Ted Molczan already had a hunch about this: as USA 129 was running a bit late when Greg observed it on Jan 27th, Ted felt this could indicate it had made a manoeuver in the hours just prior to Greg's observation. It is now clear he was right: kudos to Ted! The question now is: what does it mean? Do they have some new purpose for the satellite? At its age of 17+ years, that would be amazing! This is option #1 and perhaps the preferred option. 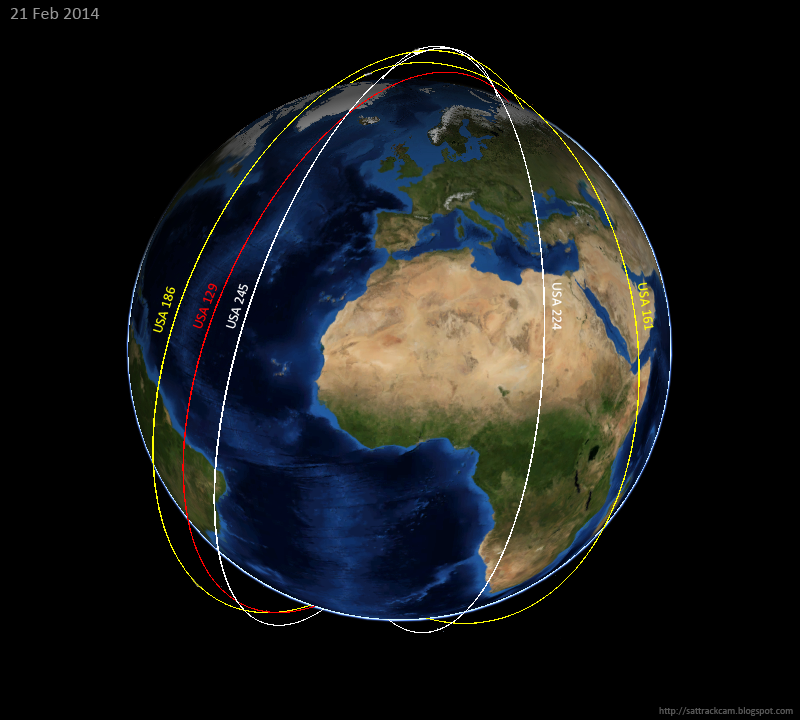 The new orbit appears to be sun-synchronous, which is preferable for an operational optical reconnaissance satellite. Or is this all in preparation for a de-orbit later (option #2)? If they are running low on juice for example, they might have opted to bring the perigee of USA 129 down as far as possible and next use natural decay to bring down USA 129 even more, to say 150 km, and then do a final de-orbit burn (option #3). This is a scenario a bit similar to what NASA did with UARS in 2011 (except that they could not do a final de-orbit burn and had it re-enter uncontrolled, something which I don't expect for USA 129). But that is (extremely) wild speculation. It will be interesting to see what happens with USA 129 the coming days, weeks and months. Another interesting moment will be reached in two days from now: will USA 129's younger sister ship USA 186 (2005-042A), indeed be boosted into a more circular orbit, as I expect? This is off-topic as it is not satellite related: but cool enough to warrant a post. 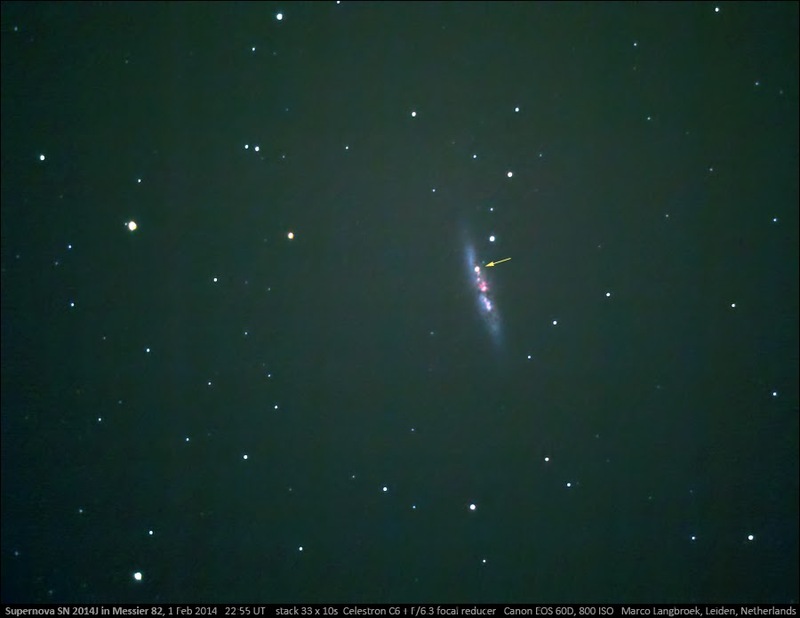 As about every astronomy afficionado will know by now, a Type Ia supernova was discovered in the relatively nearby bright galaxy M82 in Ursa Major (the Big Dipper) on January 21, 2014. 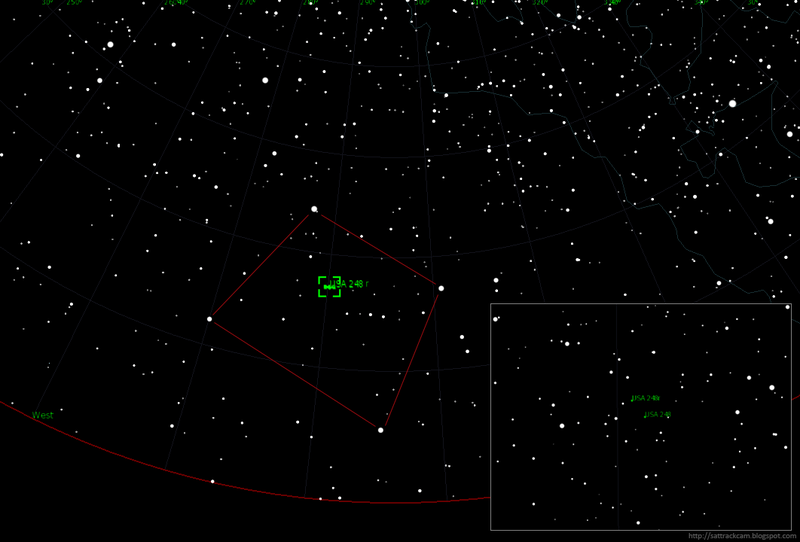 The supernova, SN 2014J, was discovered from London (! ), UK, by astronomy students of University College London during a teaching session. Being relatively near, it is relatively bright: about mag. +11.5 upon discovery, it currently is peaking at mag. +10.5. Of course I was still hoping for clear skies in the Netherlands, so I could try to observe and image the supernova with my own Celestron C6 Schmidt-Cassegrain. As day after day of bad weather passed, my frustration grew. I was pretty miffed when a few days ago an evening started clear, but haze came in while I was setting up the telescope. Grrrrrrrrr!!!!!! Yesterday evening my luck finally changed: a nice clear sky at last! I set up the Celestron C6 and after some quick aligning, pointed it to M82 and M81 in the Big Dipper using a 38x magnification. 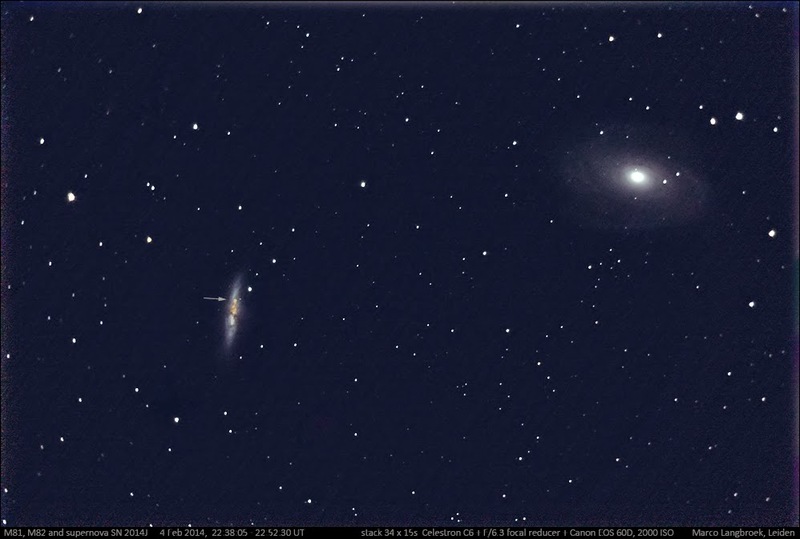 Both galaxies were easy to see, even from the middle of Leiden. 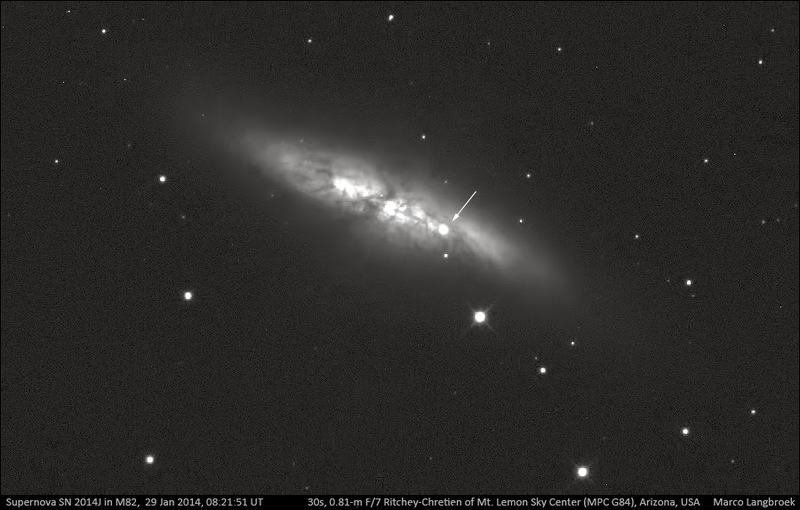 And there it was: the cigar shape of M82 had a tiny but well visible star somewhat off-set from the center: supernova SN 2014J! This was the second time I visually observed a bright supernova in another galaxy: almost exactly 15 years ago, in February 1989, I had seen supernova SN 1989B in M66 with my old 4.5" Newton.